Poland: 1970-71; Capitalism and Class Struggle, Informations Correspondence Ourvrieres (ICO), 117 pages; illustrated, Black & Red, Detroit, 1977. Really just one other thing does—a burning government building—and the cover picture of this pamphlet showing the blazing Communist Party headquarters in the Polish city of Szczecin graphically illustrates what this pamphlet is really all about: the hatred of the people for their rulers and the accessibility of the oppressors. The violent class combat that shook Poland over six years ago is recounted here from both Polish and other European sources and details the massive worker counter-offensive to a price hike and wage freeze. The accumulated grievances of the Polish working class were such that this one arbitrary act on the part of the government created a situation where its very rule was threatened. Immediately strikes were called in several cities, and what would often begin as protest marches, ended in pitched battles with the state repressive forces. Widespread looting began to occur, and inside the factories, strike committees were formed to prepare lists of demands and to wage a struggle against the government. By the middle of December 1970 a general strike situation had been reached with production completely halted in many of the most important industrial sectors of Poland. It was at this point that the government called in regular army troops and gave them orders to fire into the assembled crowds. However, many soldiers shot into the air and refused orders to charge, with the result that several thousand deaths came at the hands of the police and the party militia. According to the authors (ICO) the Polish government’s attack on the standard of living of the working class, “seemed to threaten suicide for the managers of the Party, the State, the economy. In fact, they had ‘no alternatives.” (p. 11) Polish state capitalism depends on the development of a modern industrial economy and inadequate production by workers made the government turn to “Draconian and dangerous measures” to gouge more profits out of the working class. In the eastern branch of capitalism, unions exist, but play a supervisory role, assuring that “their” particular work force meets its State production norm. In a developed capitalism such as the U.S., the unions play a much more important function—that of buffer between the workers and the real sources of power in society. In a concrete situation such as the wildcat at Dodge Truck in June 1974, workers spent their efforts confronting local union officials, plant managers, the Warren city police and a county judge (See Wildcat, Black & Red). It’s questionable whether the head of Chrysler had more than even passing knowledge of the events being played out, and certainly President Nixon had no idea of what was happening in the Detroit suburb. Things were kept local and confined by a complex of mediating organs. In Poland the reverse occurred. The dispute over wage hikes immediately escalated to a question of which class was going to rule in that country. 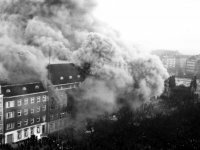 The torching of the Communist Party headquarters in Szczecin and Gdansk was accurately seen as an attack on the political apparatus in charge of the exploitation of the working class. Gierek and his crew did indeed have to humble themselves and in the end recognize that the self-organized working class was able to wield a power not previously dealt with by the Polish government. Many of the immediate demands of the strikers were met, but of course with much duplicity. The end showed mixed results. Although the working class became a force to be reckoned with, much of the thrust of their activity was used by the very forces they opposed. The strike committees were granted consultatory status thus integrating them into the entire process they resisted, and above all, production began again; the cardinal goal of the rulers. Also, unions were to be “reformed;” in other words, to allow them to play a role similar to their Western counterparts. As autonomous as were the organs of the workers’ movement they nevertheless came full-circle to when they had begun—within capital. “Workers’ power was extremely limited, even if inherent in the facts as potential and possible. The producers were willing to use this power, this control over the productive apparatus, gained through violence, as exchangeable currency to obtain concessions from those they had ‘expropriated;’ in other words, they were willing to abandon it. This done, they reinstated these rulers with all their class power. This pamphlet, as well as the last two Black & Red publications, Letters of Insurgents and Hungary ’56, maintains the theme of revolution in Eastern Europe and carries with it our fascination for the consequences of revolt in a totally repressive society. Poland: 1970-71 is of the usual high-standard of quality expected from Black & Red, and is available either from the publishers at Box 9546, Detroit, Mich. 48202, or through Ammunition Books.